We have made clear that President Trump faces a challenging fiscal situation now that he has entered office. As we laid out, part of that situation includes the impending insolvency of three major trust funds in the next eight years – the Highway Trust Fund, the Medicare Hospital Insurance trust fund, and the Social Security Disability Insurance trust fund – as well as the projected insolvency of the Old-Age and Survivors Insurance trust fund within 15 years, according to the Congressional Budget Office (CBO). These projections show crucial deadlines approaching but also the opportunity available to them to both secure these programs' finances and greatly improve the debt situation. Note: Shortfall is defined as cumulative deficits after the trust fund is exhausted. *Based on CBO's 2016 long-term Social Security projections. Currently, federal highway spending far exceeds gas tax revenue and other dedicated revenues. Lawmakers have been patching the trust fund with (sometimes offset) general revenue since 2008, including a large $70 billion transfer in 2016. But CBO projects those funds to run out by 2021 (all years are fiscal years). By 2022, spending will total $58 billion while revenue will total $40 billion; in other words, the program will face a one-third shortfall. Over the next decade, spending will exceed revenue and reserves by $139 billion – a bit more than what was projected in CBO's previous projection in March 2016. 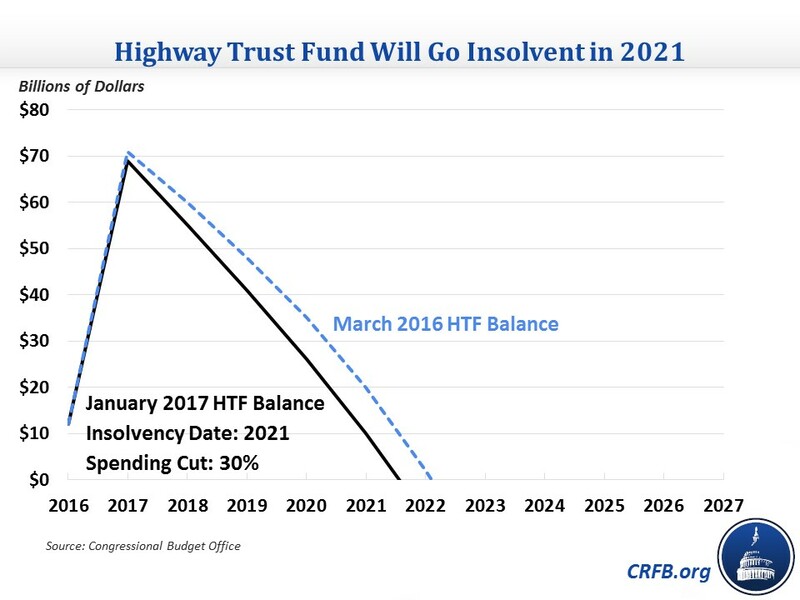 Lawmakers could close the Highway Trust Fund's structural imbalance by raising the gas tax 9 cents and then indexing it to inflation (chained CPI), reducing new highway spending by 30 percent and then indexing it to inflation, enacting some equivalent spending reduction or revenue increase, or some combination. Acting sooner will allow changes to take place more gradually and be done without relying on further general revenue transfers. A full list of options is available here. 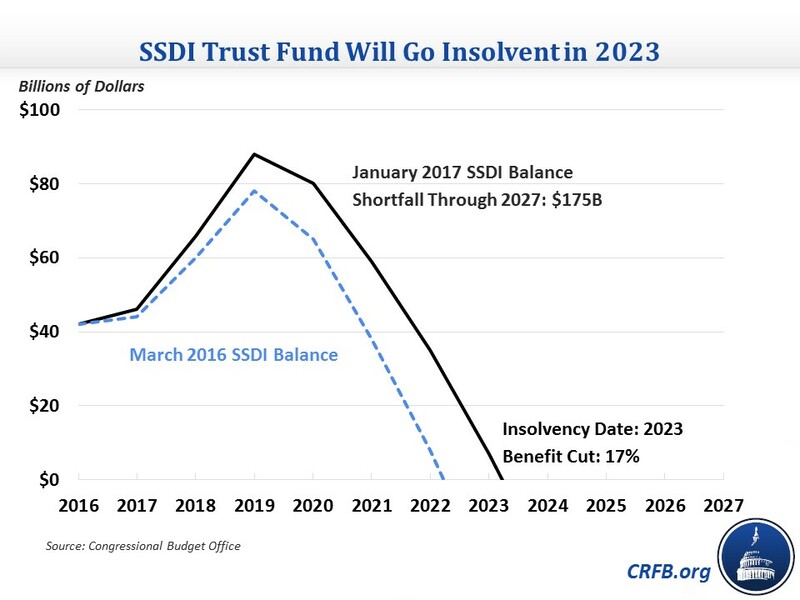 The SSDI trust fund had been set to go insolvent in late 2016 before a budget deal in 2015 reallocated revenue from the Old-Age and Survivors Insurance (OASI) trust fund to SSDI to prevent insolvency while making small changes to the program. CBO projects that this reallocation will extend the solvency of the fund until FY 2023. This is one year later than their previous projection, as CBO reduced their estimate for SSDI spending due to lower-than-expected caseloads. Still, the program faces a benefit cut of one-sixth when the trust fund runs out and a $175 billion shortfall through 2027. A number of policy options are available to improve SSDI’s solvency. In a recent report, Options to Address SSDI's Financial Shortfall, Marc Goldwein and Ed Lorenzen listed 36 possible tax or spending options to improve solvency (along with eight benefit expansion options). Many advocates have also proposed broader reforms to the disability program, some of which would indirectly reduce the program’s costs. Our McCrery-Pomeroy SSDI Solutions Initiative recently published a full book, SSDI Solutions: Ideas to Strengthen the Social Security Disability Insurance Program, fleshing out some of these proposals. The HI trust fund, which funds Part A of Medicare, is projected to be insolvent in 2025, one year earlier than previously expected. This earlier date is mostly the result of lower revenue but also from slightly higher spending. CBO continues to project an earlier insolvency date than the Medicare Trustees, who expect insolvency in 2028. HI payments would need to be cut by about 13 percent when the trust fund runs out. 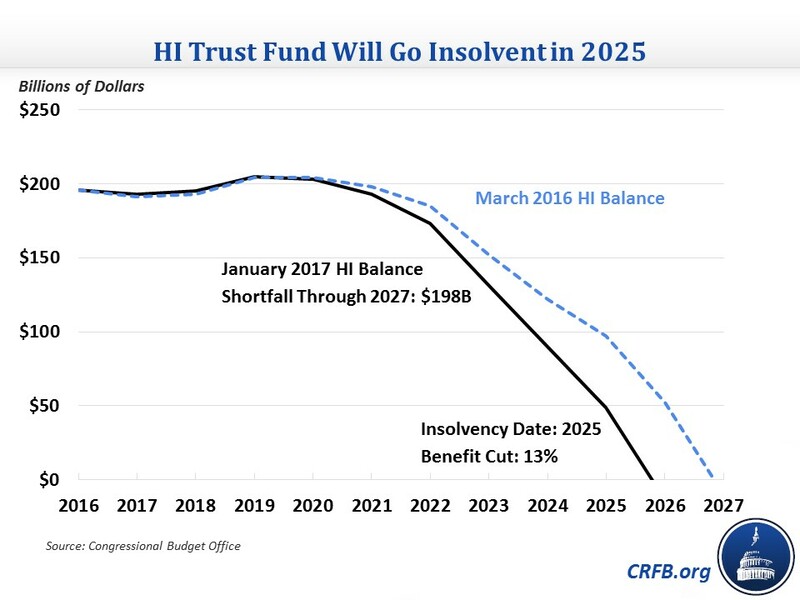 The HI shortfall through 2027 is nearly $200 billion, with all but about $15 billion coming in 2026 and 2027, so HI faces larger annual deficits than the Highway or Disability Insurance trust funds. Policymakers will need to either raise the HI tax rate (currently 2.9 percent for most people and 3.8 percent for people making more than $250,000), reduce provider payments, increase beneficiary cost-sharing, or some combination to avoid insolvency. Repealing the Affordable Care Act could adversely affect HI solvency, accelerating it to 2021 for full repeal or 2024 if just the taxes are repealed. Finally, Social Security's retirement trust fund is projected to be insolvent by 2030 or 2031. 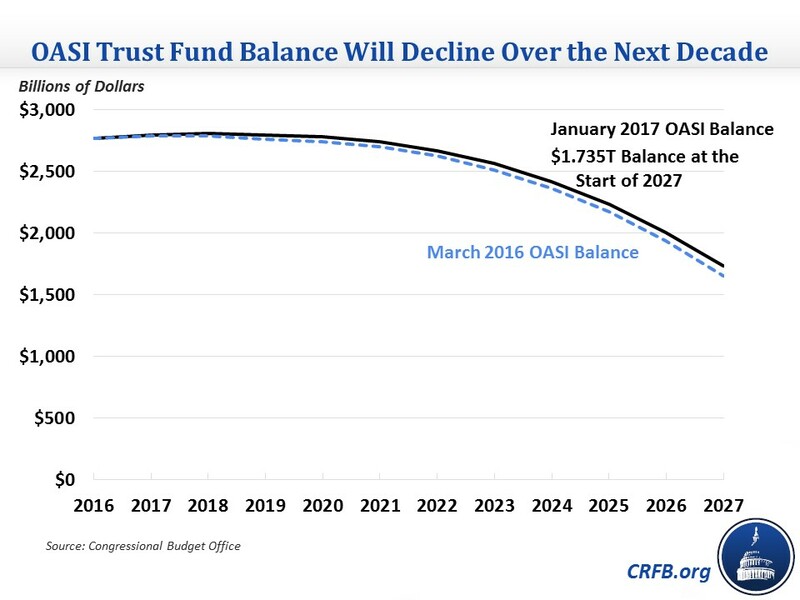 CBO previously projected that OASI would go insolvent in 2030, but the current outlook is slightly better, with the trust fund balance $80 billion higher in 2026. It's not clear whether the improvement would be enough to push the insolvency date back a year, but it is almost certain that CBO would project OASI insolvency in 2030 or 2031. Last year's projection estimated a 31 percent benefit cut when the OASI trust fund goes insolvent. CBO has a more pessimistic outlook than the Social Security Trustees, who project an insolvency date of 2035. Notably, the CBO projection shows a significant decline in the trust fund balance between now and 2027, from $2.8 trillion to $1.4 trillion, which makes clear that lawmakers are running out of time to make Social Security solvent. They have plenty of options available on both the revenue and benefit side to do so, and they should not wait until the trust fund is near insolvency or they will give themselves a very difficult task. CBO's budget projection assumes that even if a trust fund goes insolvent within the ten-year window, it continues to spend as if it has adequate resources to do so with borrowed funds making up the difference. This means that actions to make a trust fund solvent would also reduce deficits compared to CBO's baseline. Preventing the insolvency of the three trust funds – HTF, SSDI, and HI – that are expected to occur within the next ten years (a "TRUSTGO" scenario) would reduce deficits by about $540 billion (including interest) and would reduce debt from 89 percent of Gross Domestic Product (GDP) to 87 percent in 2027. Making all four trust funds solvent would have a larger effect over time and would just about stabilize the debt over the long term. President Trump potentially may be dealing with three trust funds going insolvent if he serves the maximum eight years as president, and another one would go insolvent within 15 years according to CBO's projections. These obstacles represent fiscal challenges but also opportunities to make the trust funds more financially secure, help make our debt sustainable, and improve the functioning of highway programs, Social Security, and Medicare. Both the new president and Congress should ensure adequate long-term financing for these trust funds by making changes to the programs involved or their revenue sources.